Now for those of you who did watch the video, how many of you noticed that Mario & Luigi: Supestar Saga + Bowser’s Minions, Miitopia, Pokémon Ultra Sun and Pokémon Ultra Moon were showcased on the 2DS XL? It in no way implies a limited Edition version of the console will release to coincide with the games, but it was nice to see Nintendo include it in the new video. 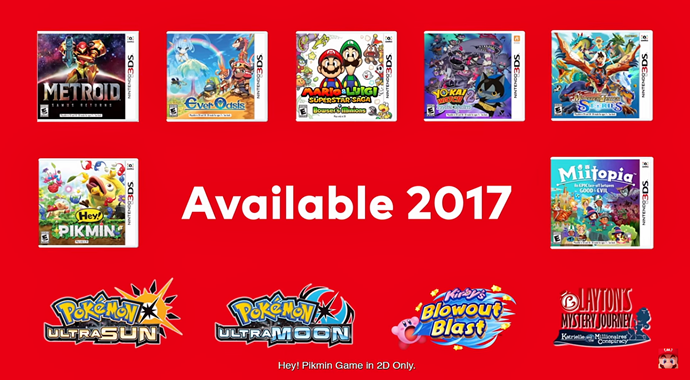 But because plenty of 3DS games were shown, which ones are you looking forwards to the most? Let us know!